Let me tell you a story about Mark Colvin. 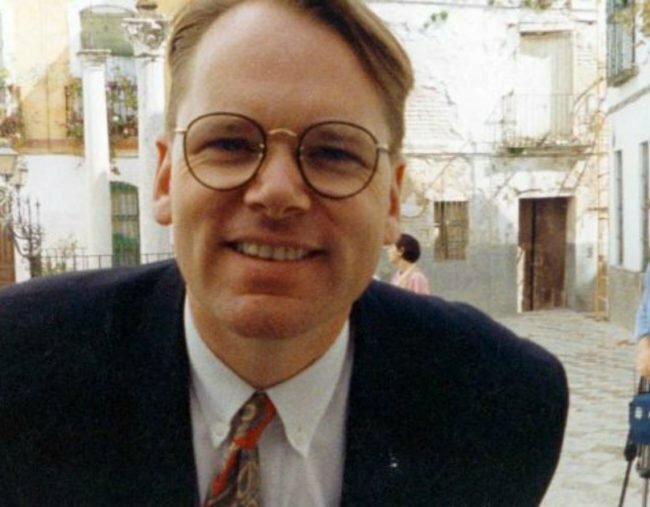 ABC journalist Mark Colvin devoted his life to telling stories. After his death yesterday, these are the stories his workmates are telling about him. I remember when I first started at the ABC in 2000. I was a runner and autocue operator. When I first met Mark, he said hello and asked me my name. Ever since then, he never forgot my name. He always smiled and said hello. He treated everyone with respect, no matter who you were or what job you did. I was a lowly [ABC] trainee when one day in walks this romantic figure, out of a novel it seemed to me. He might have come straight from Brideshead Revisited or something. Of course, I was in awe of him, and so delighted we became friends. It was probably the last on-air Q&A I did with Mark Colvin. I was on the Greek island of Lesbos about a year ago as the refugee crisis peaked. Ed Roy, the executive producer, called me just beforehand. “You got your GPS coordinates mate?” he joked. “You know the routine — Colvin will remind you that he knows Europe far better than you and grill you about whatever he wants,” or words to that effect. And so it was, as it always was. To do an interview with Mark Colvin was to enter the gladiatorial ring. You never knew what was coming, but you knew he firmly believed you should be sufficiently across the subject matter that he should be free to ask you anything at all. There was no point sending a list of suggested questions, he would have seen that only as a weakness. It was exhilarating, a breath-taking test of your knowledge and your ability to think on your feet. Colvin would have said this far better than me, but in those moments you were glad to be alive. I never met Mark Colvin, but following the death of my husband John Bean in the ABC helicopter crash at Lake Eyre in 2011, he reached out to me several times over the next few years to see how I was faring. He was always wise, caring and warm. I was touched such a busy man with challenging health problems would take the time with an ABC ‘stranger’. Every now and then we chatted away via Twitter. I remember a lovely chat about his mum’s Hereford cattle — would she switch to black angus, I asked. No way! What couldn’t he talk about with authority? Mark was a lot more than a great journalist. He was an incredibly kind man. He was working at what was then Double J, and I was a cadet. I got thrown onto the morning shift, which meant writing the news and reading the news — and I was absolutely terrified. I remember confiding to Mark that I felt really scared … and he said, “Oh, I’ll come in early and be with you”. And he came into that studio when I read my first bulletin and sat beside me and I can remember he lent across and he just put his hand on my hand to steady me — and it was such a respectful, caring, collegiate thing to do. I did a cross with Mark from New Zealand earlier this year, following Prime Minister Malcolm Turnbull’s use of a quote in a press conference which he attributed to Winston Churchill: ‘Complaining about the press is as useful as a sailor complaining of the sea’. Mark immediately knew the attribution was wrong — the quote was actually from ultra-nationalist Enoch Powell. Twelve hours later, that story was in the New York Times, as Mr Turnbull had used the quote in reference to president Donald Trump. As usual, Mark was many hours ahead of the rest of the world. I once asked Colvin why he almost never talked about his physical ailments. I will always remember Mark as a formidable intellect and one of its most incisive interviewers. But he could be fierce — as a much younger journalist I remember shaking in my boots on more than a few occasions as I did a live cross with him on PM, from say East Timor or Fiji, worrying that he’d ask me a curly one that I couldn’t answer! Overwhelmingly though, Mark was for me — as he was for so many journalists — a terrific mentor who was generous with his time and his advice, always interested, and a thoroughly decent and kind human being. The ABC is a lesser place without him. I worked with Mark most closely when he was reporting for Four Corners and I was a producer. One terrific trip filming in the US took us driving from Washington through Delaware, Connecticut, Boston and on to Wisconsin. The story was about patenting genes, but the road trip was dominated by music of the 60s and 70s playing on the hire car radio. Having started at Double J he knew most of the lyrics, and with the film crew in the front, we sang our way to Wisconsin. I loved Mark, and loved working with him. I was nervous as hell the first few times I did a live finance report with Mark at the end of PM. My voice tightened up and my body was shaking — after all, this was the same PM and Mark Colvin I’d listened to after school! After a while I relaxed into it a bit, but was mortified one day when I read out, “gold is worth (whatever the number was) US dollars a barrel”. I quickly corrected myself to say, “an ounce”, and continued to the end of the report. Mark embraced the digital age with his usual passion for communication, regularly tweeting while presenting PM, often to the mild frustration of his executive producer. At the same time, he was a stickler for the correct use of the English language. Even today, I’m still reticent to use the word icon or iconic, unless I’m specifically referring to a Russian religious artefact. My first live cross as a novice Moscow correspondent was with Mr Colvin. He rang to check I was across the background — which he was, of course. He was also supportive after a testy interview I did with then-treasurer Wayne Swan for AM. Mr Swan told me I wasn’t asking the right question. Mark said that’s how you know you absolutely are! Colvin’s standards for journalism were write well, speak well, do your research and think! On my first day at the AM, PM and World Today programs in 1999, he gave me a photocopy of George Orwell’s rules for writing. His standards were high. He thought they were just that — standard. You knew you’d done a good job when Mark would send you a congratulatory email, but the rare on-air compliment “sterling work” was real high praise, a reward for extraordinary effort and quality. As of the start of work on Monday, the phrases “it comes as” or “it comes after” are banned on PM, particularly but not exclusively in intros. This simply formalises the practice of the last decade or so, when I have ruthlessly excised them on sight. Now it’s your turn. In similar vein, countries and businesses are not to be described as “troubled”. And “impact”, as ever, is not a verb. To be clear — the reason for this is not cussedness. It is because all these words and phrases are substitutes for thought. For “impact”, for example, you could use “hit”, “affect”, “damage”, “hurt”, “strike”, “reduce the profits of”, or even “have an impact on”. Just don’t say “the car impacted the lamp-post”, for God’s sake. Early this month, I went to see the play Mark Colvin’s Kidney. The next day I was walking past his desk as he was preparing for PM. I asked him if he had seen it, to which he succinctly replied, “yes”. I asked him what he thought of it. I had just arrived from London. It was 1974 and the ABC was split, with the radio part around Kings Cross. I was trying to turn around a piece I had just recorded with Lord Clark, he of Civilisation fame, and then one of the mightiest figures in contemporary culture. I found a studio but no producer and I needed someone to listen to my reading and the mix. There stood a tall, slim, young man in jeans and specs obviously with no urgent business to hand. “Got a minute?” I asked. He nodded. Turned out to be a new reporter from Double J. “It’s about Kenneth Clark,” I started to explain to this seeming ingenue. Right, I thought. Never underestimate jeans and specs. Nor Double J, or now triple j. Mark remained a friend for 43 years. He was a true intellectual (no don’t squirm, it is a demotic term); one of the greatest journalists of his generation anywhere; a person who brought honour to the term public service broadcasting; and a person, despite his toff education, of humility and grace. Somehow he survived the agonies of his crippled years and worked without ever a flinch. Or so it seemed. And Mark, wherever you are now, send us a last tweet. You know you can. He was remarkably deep, incredibly well-read, had a brilliant sense of humour. He didn’t suffer fools. If Mark was angry, there was a very good reason for it — and more often than not in my times with him it was about an issue related to journalism … and how the story could be made better. He was an absolute craftsman and absolutely and totally focused on getting the best story he could. I recall an occasion that was both somewhat terrifying and impressive. My first live cross with Mark on PM came just three weeks after my posting to Moscow in March 2010. Terrorist bombs had exploded in two metro stations and we had spent the first hours scrambling to file radio stories, head down to one of the stations to do some filming, then race back to the bureau. Not long after this, it was time to cross to PM. Now by this stage I had worked at the ABC for several years. I had worked with Mark a few times on PM shifts and had enjoyed a few discussions with him about world events. But I was acutely aware he was giant of the newsroom and it’s fair to say I treated him as such. So, time for our live cross. Before I knew it Mark had slashed us through the basic stuff — when, how, what do we know about who. Then, in classic Colvin form, he got ahead of the story. I was just trying to keep up. “One of these blasts was at Lubyanka metro?” he asked. Yes, that’s right Mark. “That’s the closest metro stop to the headquarters of the former KGB, now the FSB. Could the location of that attack be some sort of a message?” Or something to that effect. “That actually makes a lot of sense,” I thought to myself. I agreed, and then tried to hang on as we discussed other ‘Black Widow’ bombings that had been carried out by the widows of Chechen fighters killed in the wars with Moscow. The newsroom giant had lived up to his reputation. He knew more about this story than I did! But he was extremely gracious, kept me on the line, and even reached out again for more live crosses. Hopefully I became better prepared as my posting went on. I never forgot this, and remembered it fondly when I read his memoir recently. He was so well prepared, his depth of knowledge was so deep, and his curiosity so intense you just wanted to go along with him for the ride. I am very grateful I got to experience this first hand. What a remarkable journalist. He will be missed by so many. Colvin was the master of detail. After a conversation one night after PM aired, a (pretty average) drug bust story of mine turned into a full investigation. The next night we ended up revealing that police were inflating the ‘street value’ of drugs to make their busts sound more impressive. It all came about because he did some basic maths on his intro script as he was listening to my story play out. He was the consummate journo — trusting nothing, questioning everything and making sure the figures we were told actually made sense in the real world. He taught me a great deal and I will miss him immensely. When I became the ABC’s London radio correspondent in early 1996, Mark Colvin and I hit it off straight away. I think he recognised something familiar — a naive, loud, 20-something named Mark who’d somehow fluked an overseas posting. Mark C was already pretty unwell after catching a rare disease while covering the Rwandan genocide in 1994 and had spent a good deal of the previous 18 months in London hospitals. But when I went to visit him at the Lister in Chelsea, where he’d just received a hip replacement (the drugs they’d used to treat his blood disorder were so powerful they basically dissolved his hips), it was clear he’d already had enough of sympathy and hand-wringing. So I told him jokes, sent him up mercilessly, and that big laugh of his boomed down the corridor. A friendship was born. We even had special names for each other — a gag that continued for more than 20 years. When you have a name as unusual as mine, Mark Tamhane, you expect a few wrong spellings. Mark Colvin used to delight in looking at the envelopes that came to the ABC’s London office addressed variously to “Mark Tamfare”, “Mark Tehane”, “Mark Tambane” and even the inexplicable “Mr Maric Tanhamb”. But it was a fax addressed to “Tam Hane”, which began “Dear Tam …” that had him roaring with laughter. In mock sympathy, Mark immediately dubbed himself “Col Vin” and from then on, we always addressed each other respectively as “Mr Vin” and “Mr Hane”. While you’ll no doubt see many snippets of Mark’s fine television journalism on your screens over the next few days, he was first and foremost a radio broadcaster, painting a vivid and often eloquent word picture for the listener, or managing to draw that detail out of a colleague at the other end of the line in a far-flung place as he sat behind the microphone in the PM studio. I’ll miss you, Mr Vin. Mark Colvin was already a star correspondent when I joined the ABC in 1984. I remember being caught by his writing from foreign hotspots in a style that was informal and personal rather than the strict and stodgy ABC manner of the time. Mark also cut a dashing figure as a correspondent, something people like me aspired to. Fast forward to 1995 when I was seconded from Washington to London and visiting Mark in hospital when he was critically ill. Around that time, there were concerns that Mark might not survive the year. How wrong we were. Around 22 years later, Mark overcame the medical challenges and showed superhuman strength, remaining on air with tough and penetrative interviews despite pain and discomfort. In between, Mark delivered “direct and robust” feedback to a generation of reporters who now continue the Colvin-style rigour to their reporting, interviewing and presentation. A big loss — but Mark’s contribution to journalism and a zest for life is his lasting legacy not just to his colleagues but all Australians. We had plenty of high times over the decades — whether it be arguing in a Darlinghurst pub over the relative merits of the British and European legal systems, the consequences for democracy of the post-modern populism of the 21st century, pressing the case for journalistic objectivity and fairness at Double J, or drinking in the glorious clatter of our Sydney musical faves, Radio Birdman. Their home and ours, the Oxford Funhouse, may be long gone, a relic of the Sydney of the 1970s. But their furious spirit, their energy and, yes, their optimism, imbued the rest of Mark’s work and life. Mark was contained in the Sydney newsroom when he should have still been roaming around the world. Making him laugh was a goal. And he could roar! He adored his sons. I remember when one of them scooped a picture of a young couple publicly copulating on the roof of a building on Broadway. It made page one or three or something of the Daily Telegraph. He could not have been prouder. He was a renowned stickler about standards and reputations. He rang me after I tweeted in reaction to Julia Gillard’s “misogyny” speech that she had “eviscerated” Tony Abbott. Had I gone too far as an ABC employee? I stood by it, and I still do. It was probably the only time I disagreed with him, but I love that he reached out to me. In 2014 I was to do a cross into PM from London about the fallout from the Scottish referendum. Just at that point, the so-called ‘West Lothian’ question, a constitutional conundrum that even Mark called ‘abstruse’, was actually the hottest topic in town. It turns out Mark had filed a story based on this very thing 30 years previously, and we had an excited chat about it. He went on to reflect on air, laughingly, how his “obscure” story never got to air. I had been getting a little nerdy about the topic myself, and was chuffed as all get-out that I could, however briefly, meet Mark Colvin somewhere on his wavelength. His bracing intellect always made reporters, and public discourse, that much better. As a radio current affairs reporter in 2014, I reported on a pretty awful Perth Show ‘attraction’ that treated mental illness as a freakshow. I wrote a pretty pedestrian introduction for my PM radio story: ‘here’s what’s happening, here’s been the reaction, Anna Vidot reports’. In 18th century London, the mentally ill were a tourist attraction. As many as 2,000 people a week were allowed to wander through the Bethlem asylum, also known as Bedlam, staring at the inmates and even taunting and provoking them. It’s a practice that sounds as archaic as bear baiting or cockfighting. But now a re-creation of Bethlem is due to open at the Royal Perth Show this weekend. It includes an open ward, with more than a dozen actors pretending to be disturbed patients. And WA mental health advocates are not happy. The last time I tweeted Mark, I corrected him, telling him that pineapples didn’t grow on trees, and apologising if I’d missed a joke. It was only a couple of months ago. I hope he didn’t think I was too impudent. I’m sure he did sometimes. When I look back at our online conversations I’m embarrassed to see the times when I tried to engage him on poststructuralism and censorship and the ethics of comment moderation. Some high-profile journalists seem to think Twitter is no place for a conversation with the riff-raff, but Mark was never like that. He was always generous with his time, even with someone like me who thinks they know everything! To me it seemed like he still had some faith in those ideas we used to talk about in 2009 — that social media could even the playing field between the professional and the amateur — and I admired that. Mark showed journalists how to use digital media. @Colvinius started his career banging a manual typewriter and cutting magnetic tape with a razor blade but when he joined Twitter in 2009 he absolutely led the way. He didn’t use social media as a marketing tool for self promotion — he used it to share the fruits of his erudite knowledge and wide, wide reading. Like the greatest teacher, librarian and curator you never had, he pointed over 100,000 followers to the very best journalism and writing from the around the world. Mark Colvin made Australia a smarter place. I ‘met’ Mark Colvin via Twitter. Of course, I followed him! He tweeted so much fabulous information that you’d certainly be uninformed in not following him. One time, I gulped, steeled my nerves and responded to one of his tweets with a question. He would no doubt ignore me so what did I have to lose? I was as nervous as anything because, well… he was the Mark Colvin and I was a newly minted, fresh-faced journalist. What if my question was stupid? What if he thought I was a moron? But I had no reason to fear because, of course, he responded perfectly rationally to me on Twitter and was encouraging and friendly. I know other people have said the same but I always felt he was a kind of mentor for me as I navigated the noisy world of Twitter. It sure is a really sad time for Australian journalism.